Sebastian Cox is a spectacular modern craftsman who is looking for ways to push beyond traditional crafts into contemporary and future design. His sophisticated furniture design combines traditional techniques and know-how with renewable materials and new technology. Sebastian has proved again and again that traditional crafts can be used as tools for inspiration, revealing opportunities that lead to the use of new materials, processes and technology. There is a persistent opinion that traditional crafts cannot be coupled with new technologies that by doing so ancient skills and knowledge will eventually be forgotten. 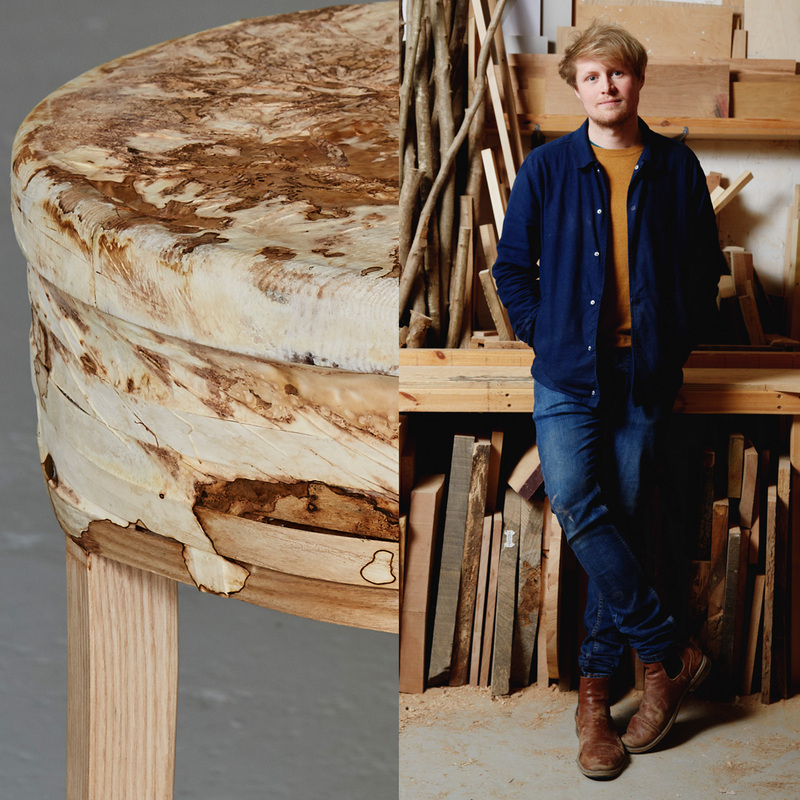 But I have the feeling that most of us consumers, admirers and onlookers have only learnt about the techniques of coppicing, swilling and cleaving wood because Sebastian Cox introduced us to those traditional skills as part of his furniture-making. His designs are convincing not only because for the appreciation of an ancient craft but also for their sleek contemporary aesthetic. The notion of progression into a modern era of craftsmanship is fast growing among craftspeople and designers; but even so, the degree of awareness and acceptance among consumers is slow to increase. Sebastian knows about the challenge of winning consumers over to favour natural native materials. He feels that it is part of the designers’ responsibility to nurture the awareness of consumers and retailers for environmental sustainability, its possibilities and its consequences. And this he does by making domestic objects, because he believes that this helps people to get accustomed to materials, textures and colours that initially appear odd. Compared to the prime hardwoods that are most commonly used in furniture-making today, native timbers such as English walnut, English beech, London plane, English alder, tiger oak, English ash and English chestnut show imperfections and vary in tone and texture. Logged wood is generally only considered to be of good quality and commercial value if it is homogeneously coloured and textured. Sebastian explains that the forests providing such wood have been managed for many decades and often enough the method embraces only a few species, partly in response to fashion and colour trends. This focus on only a few species causes major environmental problems. To manage woodlands sustainably it is important to grow a range of species, in order to assure biodiversity and enhance carbon storage. Consumers and designers should develop the habit of choosing various types of wood that display a range of colours, grain definitions and material strengths, and the beauty of imperfection that wood naturally supplies. “If the woodlands are well managed they deliver an abundant resource,” Sebastian says. Woodland management can produce a supply of young woods by taking advantage of the fact that the plants are self-replenishing. The old tradition of coppicing, as it is known in English, has been practised in Europe since prehistoric times, providing firewood and quick growing material for fencing and hurdle-making. During the 16th century it was made into a standardised silvicultural system in England, regulated by a statute of Henry VIII, to ensure the supply of charcoal for pre-industrial iron production. Well-managed coppiced woodland grows into a diverse area covered densely with shrub-like trees harvested in regular cycles of 5-10 years, depending on species and age. It provides an ever-changing environment and so maintains rich biodiversity. Sebastian strongly believes that a rise in the commercial value of coppiced timber will provide a strong case in favour of woodland management. The studio’s dedication to CHAMPIONING BRITISH WOODLANDS is what drives it forward, and it seems to me that this perfect ambition gives Sebastian the overall clarity that allows everything else to fall successively into place. One can only tip of that top hat in admiration and respect. The new studio complex in the south-east of London is composed of a studio, a workshop, a mill and a laboratory – each of these being a separate space, each set up for its own purpose and yet all closely connected. Each space is bright and gives an impression of lightness, despite the heavy machinery and wood panels stored along the walls. 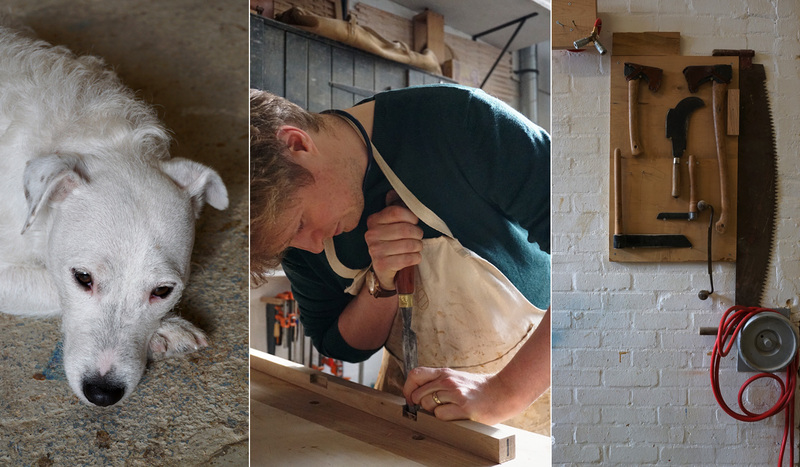 The incredible clarity of Sebastian’s entrepreneurship manifests itself not only in the furniture he makes, but also in the spaces he enjoys working in. Coppiced wood served as inspiration for Sebastian’s design processes as all the traditional crafts involved are closely linked to the materials it provides. 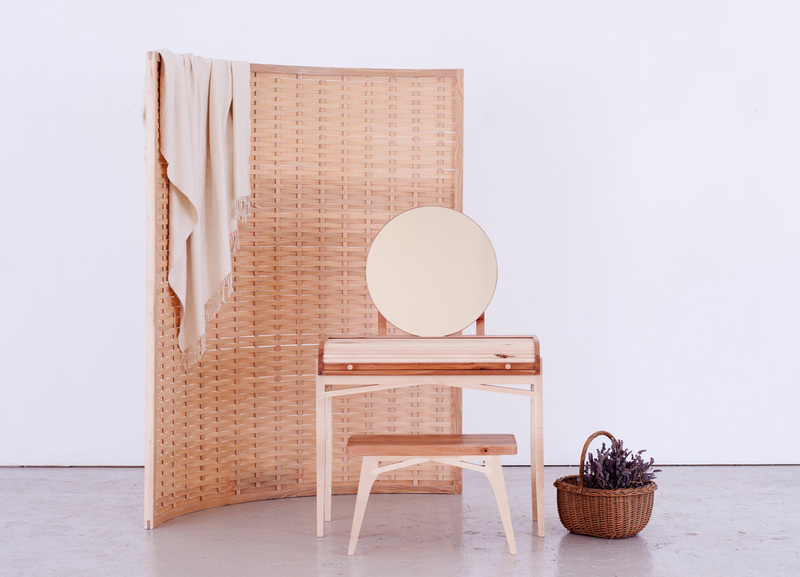 Such as the abundance of coppiced hazel, which produces small material and leads to the hand-woven finishes of the Bayleaf collection, the collection has now grown into one of the studio’s signature styles. Sebastian applied this technique that was traditionally used for basket-making to furniture-making and accordingly had to adapt it to larger structures by weaving larger panels. Each piece of furniture embodies a beautiful lightweight and textured aesthetic. 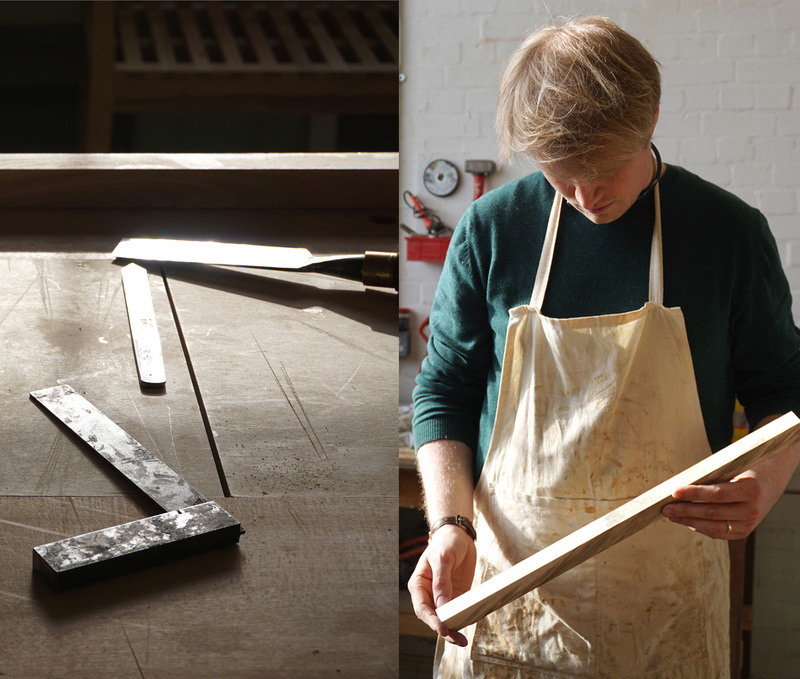 Expanding the method, Sebastian has now used various species of coppiced timber such as English sycamore, English sweet chestnut or English ash. 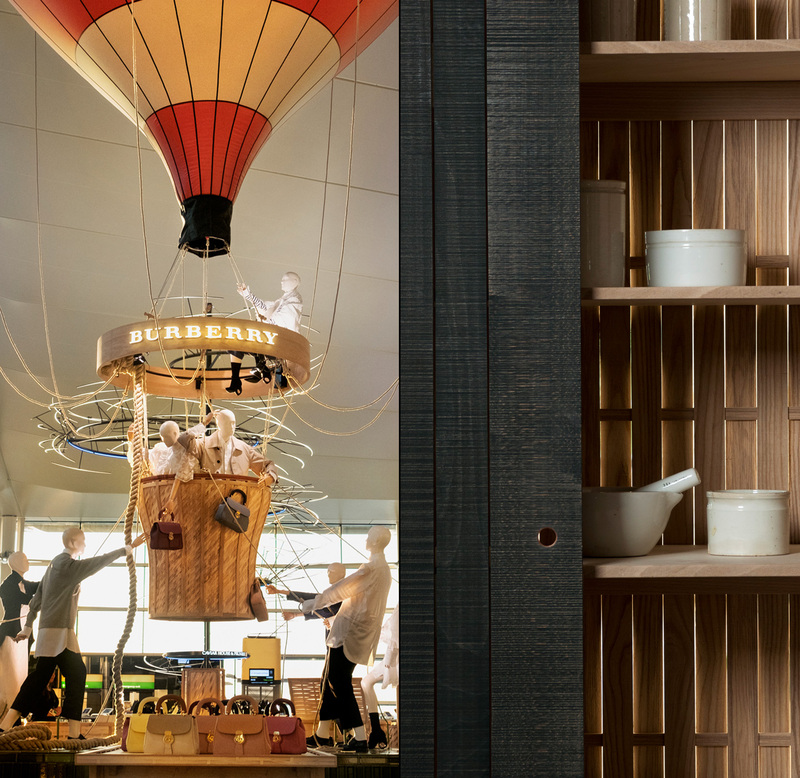 This radical approach has led to much recognition and to collaborations with companies such as Burberry, Benchmark, deVOL and with Sir Terence Conran. 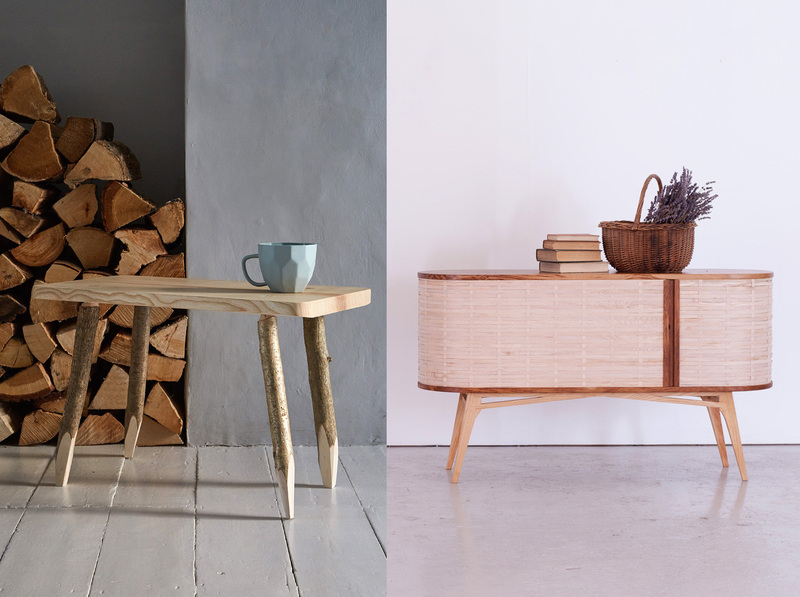 It won Sebastian the Best Newcomer award at Decorex International 2016, and in 2017 the Bayleaf sideboard was showcased as part of the Rising Talent Awards at Maison&Objet. Sebastian and I started talking about the future of crafts: he strongly believes that both the preservation of traditional crafts and a progression into contemporary design are key. What will preserve traditional crafts in future designs is a deep understanding of the material. “This can only come from using that material in an in-depth way”. Once you gain knowledge about the material you can find new ways to apply this knowledge in a digitised context. 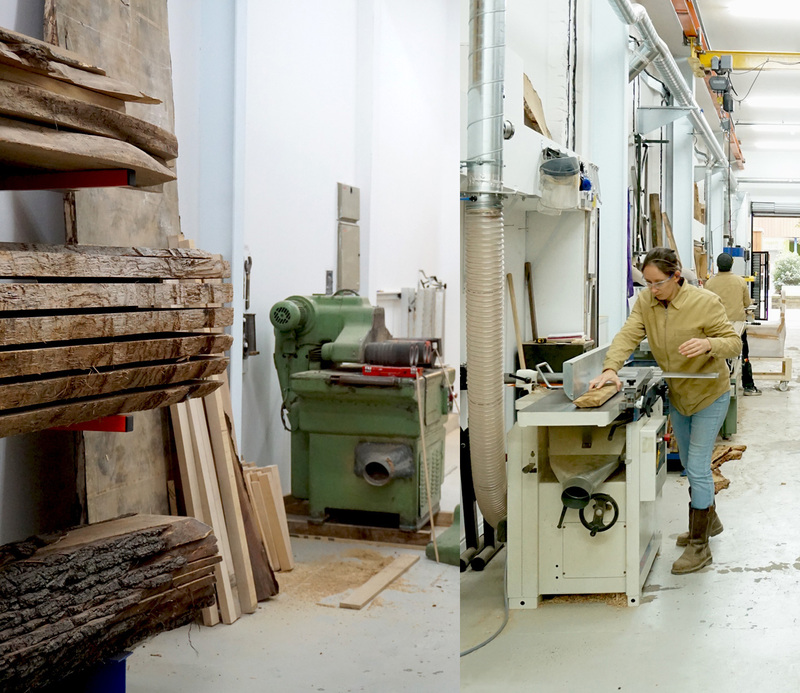 “You can apply the knowledge you gain from cleaving a piece of wood to how you CNC’ a piece of wood…It’s just another tool,” Sebastian reflects on the use of CNC machines as craftsman (CNC – computer numerical control – is a digital automation system for machine tools that ensures controlled motion along multiple axes). The future of crafts depends on the cultural heritage that is stored in meaningful, contemporary products. When talking about “meaningful products”, Sebastian has a very specific definition of them. Crafted objects embody a sense of cultural heritage and are thereby distinguished from short-lived disposable products; this presents a key argument for sustainable design. Since 2003 UNESCO has recognised traditional craftsmanship as an element of the intangible cultural heritage, and attempts to encourage artisans to continue to produce craftwork and to pass their skills and knowledge on to others. If the activity of craftsmanship, and not the product only, is safeguarded as an element of the cultural heritage, then its value rises with the extent to which it is appreciated. It offers the opportunity to create meaningful products in different parts of the world. “There will be some specific process, like the (English) tradition of swilling, which is carried out with a slightly different technique, with slightly different tools and slightly different materials, from how it is done in other parts of the world”, Sebastian argues. With the laboratory Sebastian has recently expanded into the field of biofacture, in which he is exploring the relationship between wood and mycelium (fungus) and is further experimenting with growing organic material from them. Even though the process of growing is one that takes care of itself, Sebastian argues that an in-depth understanding of how those materials work together makes biofacture a craft-like discipline. It is a new way of producing materials that provide a sustainable alternative to materials like plastic, rubber and leather. Mycelium + Timber is a project Sebastian is pursuing in collaboration with Ninela Ivanova, in which mycelium that has been cultivated using strips of goat willow grows into a suede-like fabric. “These two materials have a natural relationship in woodland,” Sebastian says, and it made him jump with joy to realise that its cultivation appears to be an amazing opportunity for wood: goat willow is an ideal species to coppice, being fast growing, but it is too weak a material for furniture-making. The opportunity it presents is that it rots very quickly and binds well with the mycelium, which makes it an ideal species to grow the fungus grow on. So there again is that clarity that strikes me in all the complexity of Sebastian’s work. It is all rooted in his ambitions with regard to championing British woodlands. If biofacture could become an important player in our material culture in the near future, it might turn fungus into a commodity, which people will very much want to invest in. And that in turn will become a very good argument for preserving biodiversity. Creating domestic items such as the lampshade and stool made of fungus material, Sebastian is cautiously introducing this very odd-looking material into our homes, so that we start to get used to the change it will bring about in our material culture.